With all the attention on pilots and automakers/tech company investment in autonomous transportation, it is easy to get caught up in cool technology and how it works. More importantly, autonomous vehicles (AVs) will undoubtedly spawn new business models and opportunities for entrepreneurs and start-ups. 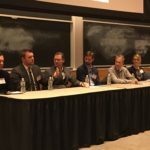 The MIT Enterprise Forum of Cambridge CleanTech event – Ubiquitous Autonomous Vehicles: Upending Industries: Unlocking Entrepreneurial Opportunities – covered the implications of AV for industry, the built environment, data security, safety and energy. The session surfaced lots of ideas on what new businesses and government services AVs could bring. There will be many. For more detail, check out: When AVs Become Ubiquitous: Entrepreneurial Opportunities.